Micro-Needling stimulates the skin’s natural repair process to produce collagen and elastin for the treatment of fine lines, acne scars and improvement of the skin’s overall appearance. This technique eliminates build up of waste and fluids in the face and neck. If a series of treatments done 1 -2 times per week for a series of weeks , it opens and clears the drainage pathways in the head and neck. Great for sinuses! Add on to any Facial ! Microdermabrasion is great for removing dead and dull surface layers of the skin, stimulating an increase in collagen production and rejuvenation. 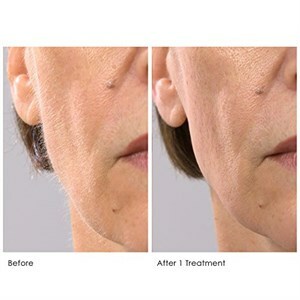 Many patients see dramatic improvements in the tone, texture, and color of treated areas after just one treatment. 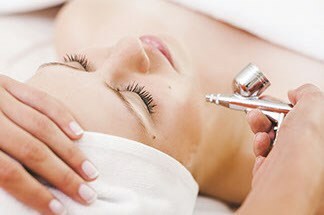 Microdermabrasion is also great for oily skin, large pores, clogged pores, mild acne scars, discoloration, and fine lines. This facial comes with cleansing, exfoliating, face massage, extractions, microdermabrasion, and mask. 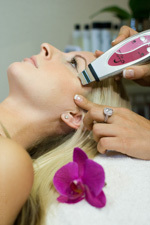 Microcurrent Facial is often referred to as a "natural " facelift. This Facial is ideal for anyone who wants to improve appearance of their skin, whether they are more focused on an anti-aging or preventative treatment because it covers all the bases. A microcurrent facial emits extremely low-voltage electrical currents, which mirror your own body’s electrical currents, on a cellular level to repair damaged skin and stimulate collagen and elastin production.A microcurrent facial is ideal for anyone who wants to improve the appearance of their skin, whether they are more focused on an anti-aging or preventative treatment because it covers all the bases. 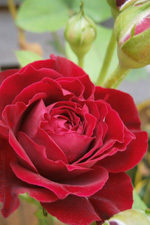 It is safe and effective on all skin types and skin colors. Microcurrent uses two wands that send currents back and forth to each other which result in tightening and toning of the muscle. This treatment is also popular for those who have paralysis in the face and would like to gain more control of their muscles. An Oxygen Facial immediately revitalizes your skin and hides even the tiniest imperfections. It has exploded onto the beauty scene largely due to its instant results, characterized by a smoothing and plumping of the skin's surface. Oxygen is sprayed at a high pressure directly to the skin's surface. A serum containing active ingredients like nutrients and vitamins are atomized and delivered as a soothing mist. The oxygen acts as a ctalyst that opens up the skin's pores to allow increased absorption of the active ingredients. Originally considered an anti-aging treatment, the oxygen facial has a place in any facial routine. The Perfect touch is an easy to use, compact device with a high frequency electrical current that delivers precise electrical sparks through micro electric probe to dehydrate a skin growth. 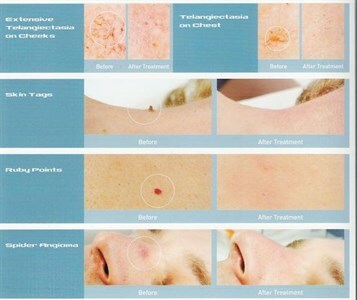 Results are seen almost immediately and all treatment are permanent.Almost all times, the probe remains apart from the tissue being treated.new skin cells start regenerating from underneath. Dermaplaning is a simple and safe procedure for exfoliating the epidermis and ridding the skin of fine vellus hair (peach fuzz). Most used on clients with rough, dry skin, superficial hyperpigmentation, mild acne scarring, or fine lines and wrinkles. 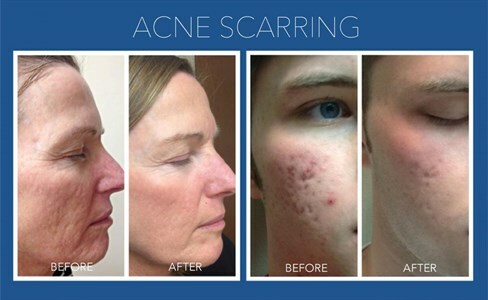 The treatment results in a more refined, smooth, "glowing" appearance. There is no downtime associated with this procedure. Dermaplaning can be done as often as every two weeks, although it is usually done when vellus hair starts to grow back, which is generally in one month's time.